If you’re shopping around for the perfect storage space, we’re here to convince you that you’ve found the right spot. Things are a bit different, and a bit better here at J & B Storage. Not only do we have a convenient location for our self-storage facility, near highways 287 and 402, we also provide unlimited access to your unit, no-commitment contracts, a variety of storage room sizes, unparalleled security, and support when you need it. Since our facility is self-service, you can truly access your storage unit as you’d please. We have a secure, electronic gate system installed which means that our renters can come and go as they please. The electronic gate is operated by code, and individual storage units can be locked with personal locks (we sell locks too!). Stay as little or as long as you’d like. We provide storage unit rentals month by month, so if you’re uncertain how long you’ll need the extra space, don’t fret. You can stay as long as you’d like. If you are ready to give up your storage space, just give us five days of notice. Each storage space is priced accordingly, and we offer discounts for extended storage, as well as senior discounts. With over 500 storage units on the lot, you’re sure to find the perfect fit for your needs. Sleep soundly knowing that your belongings are safe on our lot. Here at J & B Storage, we take security very seriously. Our units have secure metal garage doors which are virtually impenetrable with the right lock. We keep the facilities well lit, even at night, and we have a variety of cameras running around the clock, so that we can see any comings and goings on the property. 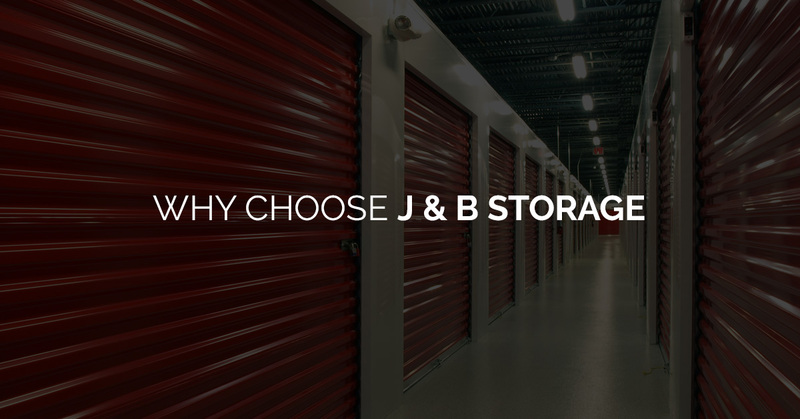 J & B Storage’s lot owners even live on premise, which means that response time couldn’t be shorter if there ever were a threat to the security of your belongings. So many storage facilities neglect to make their lots convenient. Instead of a tight maze of storage units, we have units that are very easy to access. You can even drive a semi-truck through the lot. That’s great news for folks that are parking their RVs and boats, as well as our clients that are using our units for commercial storage. We hold office hours throughout the week so that you have the support that you need. Our hours are nine to five on Monday through Friday, and from nine to noon on Saturday. After-hour and Sunday appointments are also available by request. Well, we’ve done our best; we hope that you’re convinced that you won’t find a better storage facility here on the Front Range. If you’re further curious about our storage units, or if you’re ready to get a free quote, don’t hesitate to get in touch with us!